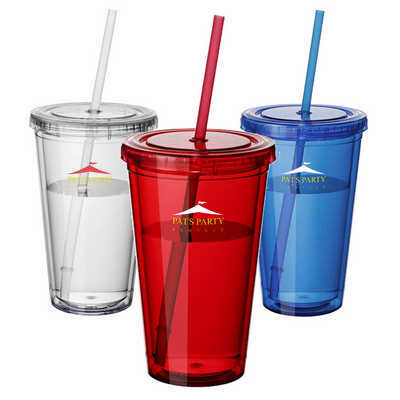 High quality double wall plastic tumbler. Strong and durable. Long and strong straw with stopper, easy for sipping. Screw top access and leak tight. Straws are packed separately. BPA free. Individually packed in a white box. Product Dimensions: 100 mm x 100 mm x 158 mm(exclude straw). Capacity: 473ml. Printing Area: Pad Printing: 45 mm W x 45 mm H. Screen Printing: 210 mm W x 100 mm H. Colour Range: blue, red, clear. Decoration Methods: Pad Printing, Screen Printing. Price includes : 7 days 1c/1p printed. Setup is not included, please ask for a final price from your sales representative.